The process was used effectively to predict flu spikes. People start Googling for flu symptoms just slightly before flu outbreaks. So, reporting spikes in these correlated queries gives public health officials a signal that something is coming. With a little imagination, you can see how this tool might have econometric or financial applications. Take your favorite stock, for example, and see what search queries correlate with its behavior. Perhaps people Googling "new car" provide an indication that the auto market will improve. Then you can use that query series as input into a predictive model for the sector. Overall, I think it's a spectacular idea, but hasn't worked for any of the few practical applications I tried. 3) Copy and paste into correlate.googlelabs.com. I'll take that as a "nothin'." All look spurious, but interesting. "Windows" inexplicably comes up several times. I really don't know how to interpret that. 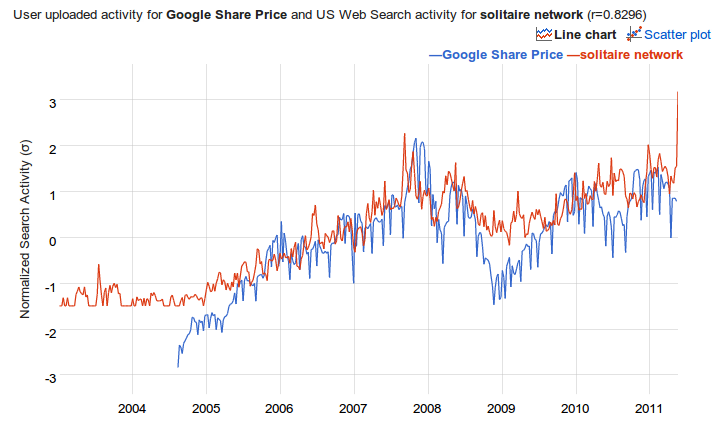 Of all the search queries in the world, Google's share price seems to have a correlation with medical spas. I'm quite surprised that the spurious results win over anything real. Maybe the trader-bots have won afterall, or every tech trader is using his bloomberg terminal exclusively. 1. "Frankenmuth Michigan" is highly correlated with "kitty litter" and "ear mites." 2. "The Onion" is correlated with "colon use" especially in Vermont. 3. "Vernors", a regional pop from Detroit, is correlated with "BB guns" at a two-week lag, and also almost every item of quirky Michigan-kitsch-icana. 4. "Pepsi" is correlated with "Bedroom expressions" and "Wolf Robotics." These are entertaining bloopers, but I am disappointed my quick explorations didn't point the way for this as a more useful tool. Looking at the results above, I wouldn't be surprised if even the "flu" and "mittens" probably are not directly related to the search queries so much as they are picking up latent variables, such as weather. The seasonal effect is dominating any relevance of the increase in queries. That is, it's not that searching for flu symptoms is a genuine indicator of flu outbreaks---you're not searching because you feel like you're catching the flu---so much as that during winter, people get the flu, and people search for flu symptoms. And mittens. And sometimes kitty-litter, apparently. And that there's enough noise in all other queries---everything else is so unrelated in the great booming confusion that is internet search---that the effect of seasonality alone is enough to look like a related indicator. Don't get me wrong, it'll still work because this correlation is founded in a shared relationship, but it won't necessarily be more informative than "flu outbreaks tend to happen when it's cold out," something you might proxy more easily (thermometer) than by scanning through Google search queries. Still, even if that's true, I'm surprised. There are enough independent queries that the spurious correlations, like that between Pepsi and Wolf Robotics, seem like they should overwhelm almost any valid correlation out there. Identification, as always, is the problem. Have you had any more luck than I have? Post a reply in the comments!